I really should make muffins more often. They are perfect for breakfast, beautiful as an afternoon snack, and happiness just before bed. Beautiful little bundles of goodness. When a recipe calls for Chai Tea, Buttermilk, and Pistachios and you happen to have all of them in the house….it’s a sign. These Pistachio-Chai Muffins have hints of cinnamon, ginger, star anise, clove, cardamom…all the wonderful spices that make Chai Tea so comforting. Combine flour, brown sugar, baking powder, baking soda, and salt. Cut open tea bags and add tea to flour mixture, stirring well with a whisk. Make a well in center of mixture. Combine buttermilk, melted butter, vanilla, and egg in a bowl, stirring well with a whisk. Add buttermilk mixture to flour mixture, stirring just until moist. Place 12 muffin cup liners in muffin tin, coat liners with cooking spray. Divide batter evenly among prepared muffins cups. Sprinkle chopped nuts evenly over batter. Bake at 375 for 15 minutes or until tooth pick inserted in center comes out clean. Cool for 5 minutes in pan on a wire rack. Combine ½ tsp. vanilla, powdered sugar, and water in a small bowl, stirring until smooth. Drizzle evenly over muffins. 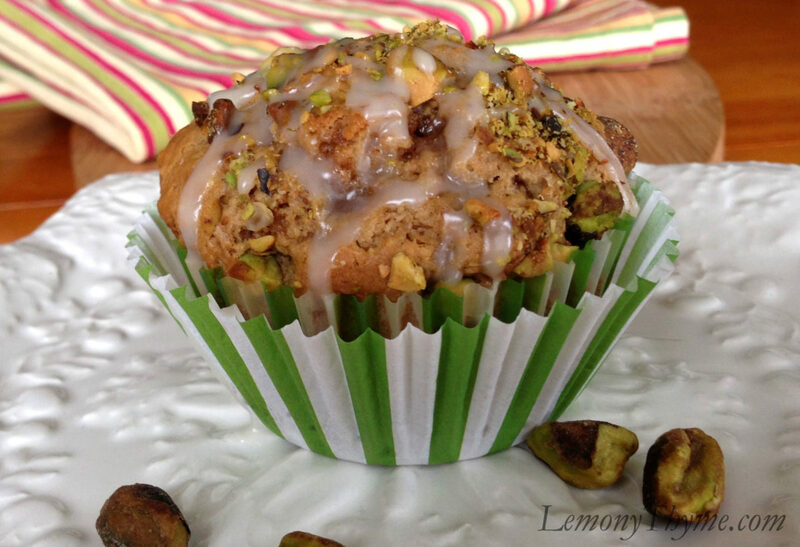 I’m making these as soon as I pick up pistachios!! I think I will make muffin tops since I love the tops of muffins more and these should be cruchy.